With the New Year fresh upon us, it is time to reflect upon the past year. 2007 was a very lively year for Apple, from the introduction of the iPhone to strong Mac sales due to the failure of Vista. Leopard was delayed from Q2 to October, but still was meet with high praises. The iPod Hi-Fi was discontinued and AppleTV saw little success. And the rumors! Even with ThinkSecrets death, Apple was hit with astonishing breaks in secrecy. From the iPhone itself (a rumor which, was floating around for years) to the new iMac redesign but, particularly the new Keyboard, which leaked to the internet weeks before the August 7th release. Same with the 6th Generation interface changes, which a video was first posted on MacRumors in July, months before it’s September 5th release. Images of the 3rd Generation iPod Nano before introduction or recently, the iPhone 1.1.3 firmware update videos and pictures that is currently running wild. But, more importantly, Apple has grown significantly. However, with large growth comes new challenges, being a larger company with a bigger install base and stiffer competition. In the New Year, Apple has to keep up with its market and products- from the iPod to the Mac. For the past few years, Apple has done a great job of keeping it’s iPod line selling, but can they continue with the iPhone or the Mac? Only time can tell, but 2008 has the potential to seriously expand in many markets. 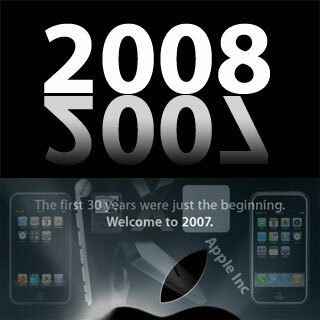 2007 was a great year for the company- the question is: What does 2008 have in store for us?